The picture says it all!! What a great addition to any party. Polar Pete will be a hit with the party guests. He stands almost 3 feet tall and will be the life of your party. Easy to use and it comes with a scoop and supplies to serve up to 50 guests. 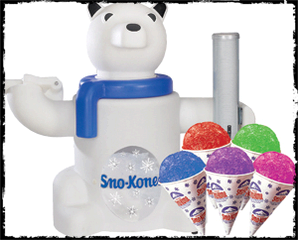 Choose 4 flavors from: grape, cherry, lime, orange, strawberry, green apple and blue raspberry.